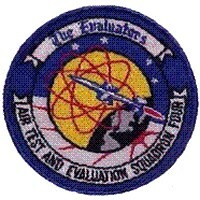 Air Test and Evaluation Squadron Four was established in 1950 and was mostly responsible for evaluating guided air-lauched missiles and establishing operational procedures for these. It began using the Crusader in the late 1950s and operated practically every version of it until the 1970s. Operating from NAS Point Mugu, the Evaluators tested the Sidewinder, but also the Zuni rocket and Bullpup missile, as well as other Crusader equipment. VX-4 was disestablished in 1994.